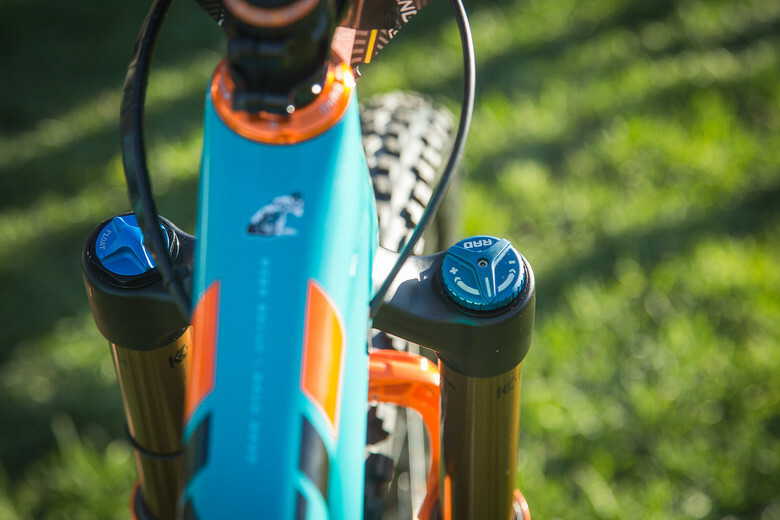 Check out the big man's Yeti SB5.5c with big wheels for a little place called Aspen. Richie Rude, one of the most successful and also largest competitors on the Enduro World Series has made the switch to 29-inch wheels for the race in Aspen this weekend. He's been racing a Yeti SB6c with 27.5-inch wheels until now, swapping to the SB5.5c. The bike gets 140mm of rear travel and uses a 160mm travel FOX 36 fork. There's a custom lower headset cup insert that props the bike up 10mm to give him the same ride height as if he were running a 170mm fork. He's using CushCore tire inserts with Maxxis Minion DHF 2.5 tires and downhill casings front and rear. Big meats for a big boy! Go get 'em Richie! You can see Richie's Yeti SB6c against Cody Kelley's SB5.5c here. Jared Graves switched a while back and it hasn't worked out for him. 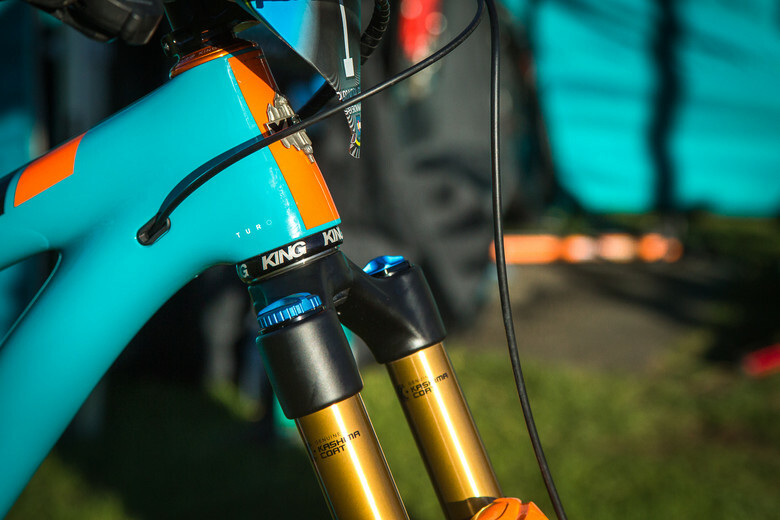 Why not just run a 170mm fork? That was my 1st thought...anyway SICK looking bike! 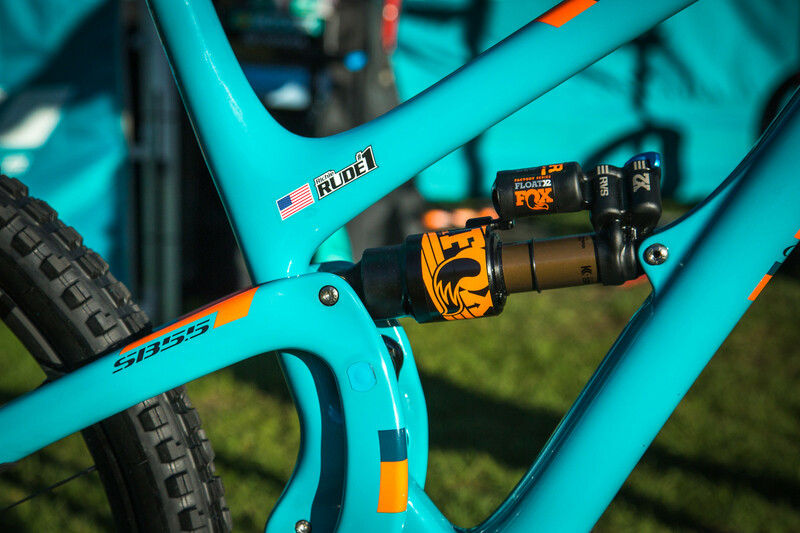 As the article says - Fox doesn't have a 29er 170mm fork yet. Bushing overlap would be a bit thin even if they did manufacture an air piston for the race guys. Basically, it'd be a full custom fork. That make sense, thanks for explanation Jeff. ...and I stand to benefit how exactly? I still stand by what I said. Especially considering most riders run 15-25% sag. Not enough bushing overlap for RR. He'd fold it on the first turn with his savage attack. Animal! 29" DH casing tires with Cushcore: heaviest enduro tire setup of all time? in the words of Kai... smash SMASH SA-MASH! i was unaware that existed. ...and he still flatted. Wow. I was wrong. Maxxis website says the 29" DH tires weigh less than the 27.5" due to wire beads. 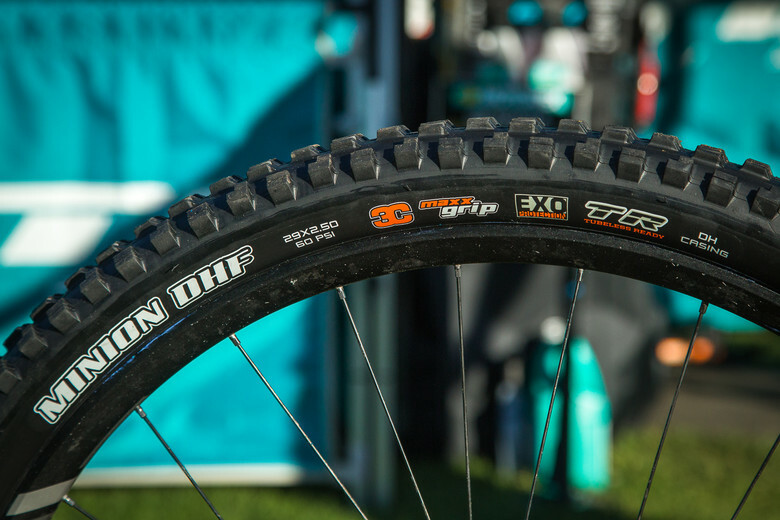 This is not the heaviest enduro tire set up of all time. I learn something new every day. 29" DHF DH casing: 1295g; 29" cushcore: 248g. That's 1543g, plus sealant in there. Freakin beast. Plus, say, his wheelset has to be around what? 1800 grams? So that's 1500+1500+1800= 4800 over TEN POUNDS in wheels and tires! CRUSHER! At 30psi and likely a Cush Core insert, check out the crosshatching on the rear tire sidewall of Rude's Yeti a few shots down. I'm surprised he hasn't been running DH casings all along. So basically, single-crown DH racing. Got it. Oh that thing his teammate has been doing the entire season? I ran 2.5 dhf f/r on my carbon hoop'd 5.5 and the side knobs were pulling in to the rear triangle. Too much for regular riding or too soft of a wheel build? Love the aggressor out back! Chomping at the bit for the 2.5 to be released so I can try that in the rear.